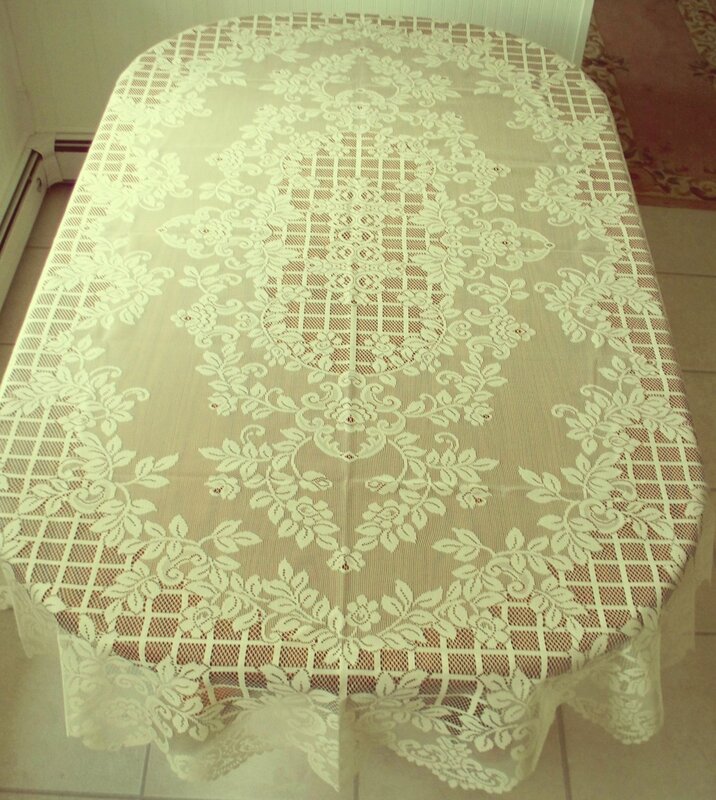 Trellis Rose 60x120 rectangle ivory tablecloth. NOTE: This is a rectangle tablecloth, not an oval. This tablecloth is on an oval table only. Called the Trellis Rose, this tablecloth is a beautifully designed trellis background pattern with winding vines and small roses adorning the trellis. The edges are scalloped. Nice quality tablecloth. Color: Ivory. We have this over a cherry wood table. You can add a colored material of you choice underneath to make the pattern pop. Size: 60x120. Will fit tables that are 36x96 up to table size 48x108. Care: Machine wash cold-gentle cycle. Hang or lay flat to dry. Touch up with a cool iron if desired. ATTENTION INTERNATIONAL BUYERS: USPS shipping cost have increased dramatically in the past few months. We want you to save money on shipping. Please click on “Terms ” and see “Shipping” for information on how to save money on shipping cost.